More than 2 million students across the country attend charter schools, many of which are leading the way in college and career readiness initiatives. Here are five ways your charter school can maximize its college and career readiness efforts, and help all students prepare for their next step. 1. Focus on student ownership of their education plans. Ensure that all students are thinking about where their education could one day lead them, and empower them to take ownership of their learning. Self-discovery assessments, college and career exploration opportunities, college application tools, and scholarship resources can help ensure that students and families have essential college knowledge and are prepared to transition to college. Some charter schools place a heavy emphasis on college readiness and are driven by a mission of college success for every student. YES Prep in Houston, Texas holds an annual “signing day” in which students sign their letters of intent to attend their chosen colleges. High Tech High in San Diego, California, encourages career exploration by requiring students to complete an internship prior to graduation. Whether your charter school takes a college-for-all approach or supports different paths for students, ensuring that every student is aware of their options, that they are equipped with information to make the right choice for them, and that they have a post-secondary plan is important in preparing students for life after high school. 2. Align course plans to post-secondary requirements. Charter schools have more flexibility than traditional public schools in terms of curriculum, instruction, operations, governance, and finance. However, they still must adhere to many state mandates, such as meeting Individual Learning Plan (ILP) requirements. It’s important to ensure that students’ academic plans are aligned to their post-secondary aspirations. 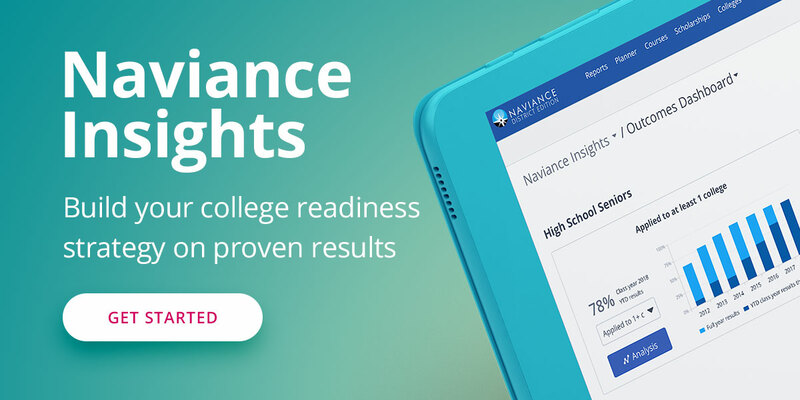 Naviance offers a variety of academic planning tools, including individual learning plans, to help enhance school counseling efforts and provide students with the right help at the right time. Naviance Course Planner helps students see if their courses will satisfy requirements at specific colleges, and where they can increase course rigor. 3. Tailor your test preparation for all students. All students deserve a fair chance on standardized tests. According to the U.S. Department of Education, nearly one-third of all charter schools are high-poverty schools in which more than 75 percent of students qualified for free or reduced lunch, and a recent study showed that charter schools benefit poor and minority students the most. Adding robust, cost-effective test preparation to your college readiness strategy gives your students the opportunity to perform their best on test day. 4. Work to improve collaboration in your network. Strong collaboration within your charter network, and with the central leadership team, can improve the educational experience for students and families. Strong collaboration can help schools and districts streamline college application processes, share best practices, and communicate more effectively. Naviance has helped BASIS schools in Arizona improve collaboration between schools and BASIS leadership by providing a central location to track college application data, transcripts sent, letters of recommendation, and test scores. Because charter schools must renew their charter every three to five years, proving accountability to authorizers (state, county, or school board) is critical. Technology tools with robust reporting and analytics capabilities can help schools set customized benchmarks and goals based on individual college and career readiness objectives and can provide a framework to show impact on student achievement with authorizers. For example, Mastery Charter Schools in Philadelphia uses data in Naviance including college application statistics and scholarship dollars received to demonstrate effectiveness in preparing students for life after high school. Download our free charter school resource kit to learn how to increase student engagement, make data-driven decisions, and offer comprehensive guidance to every student.